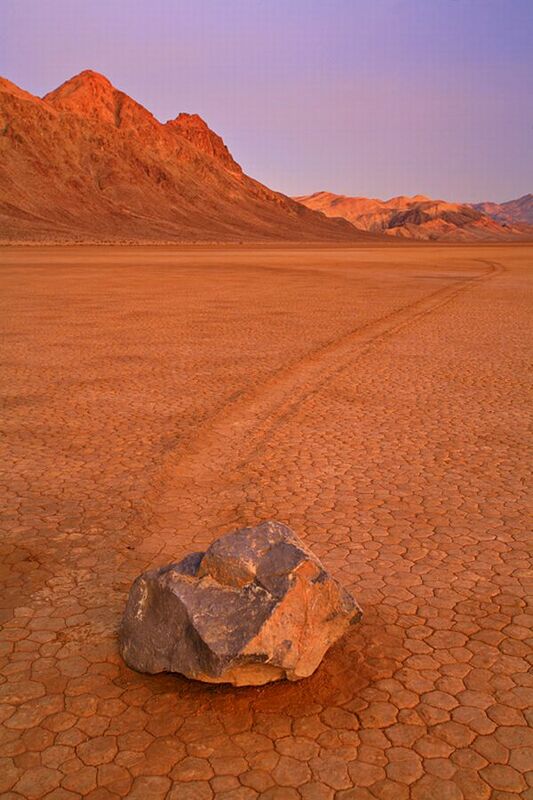 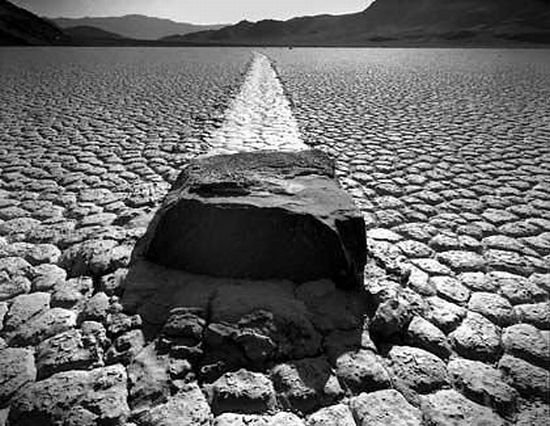 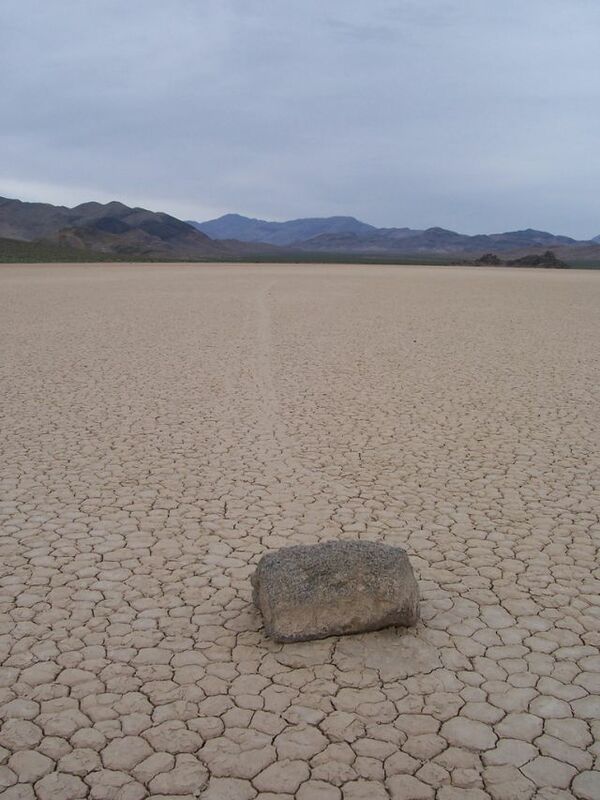 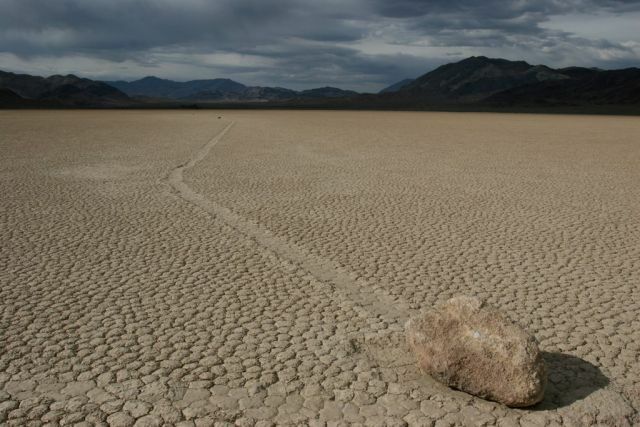 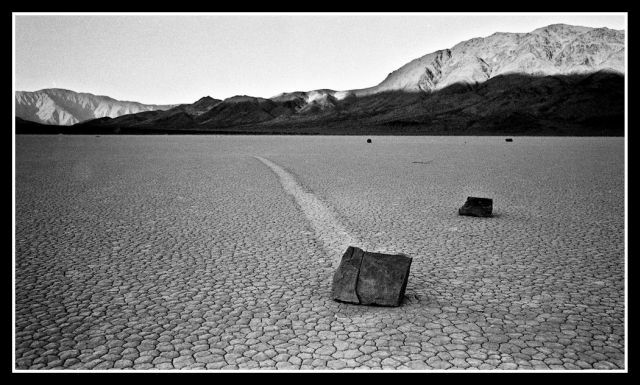 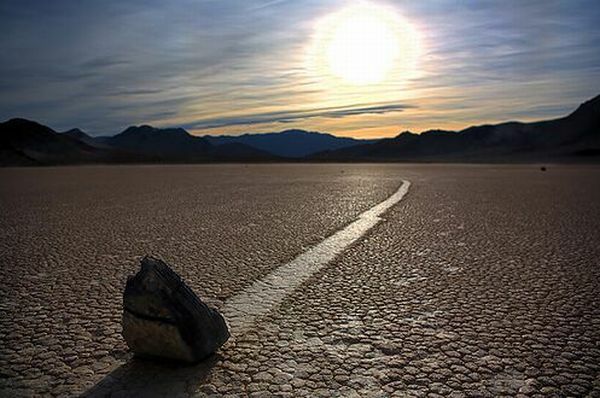 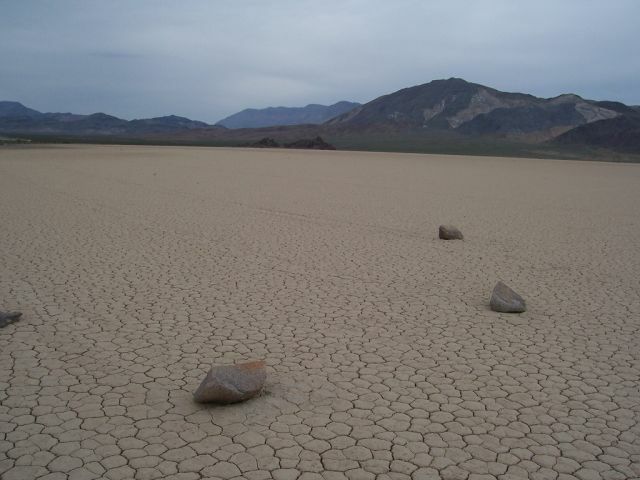 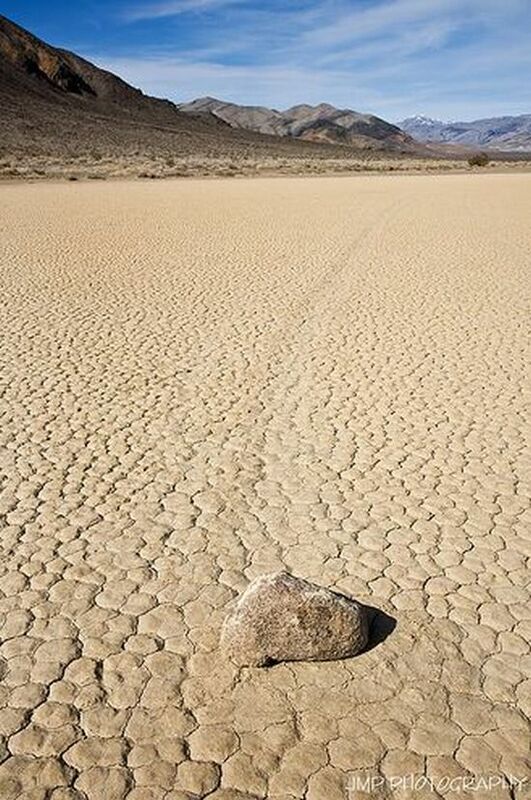 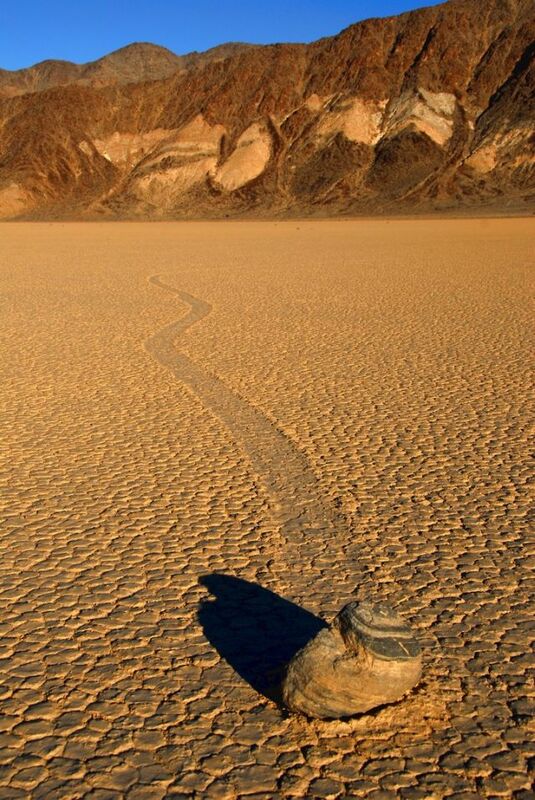 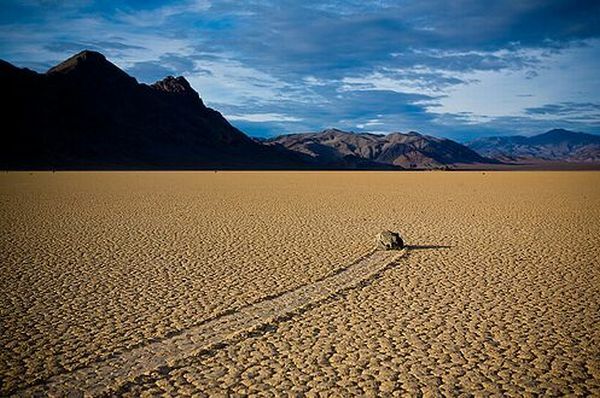 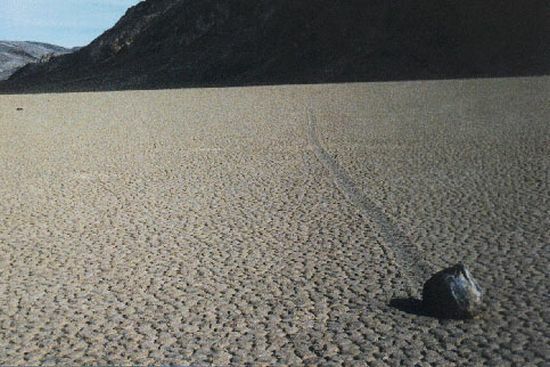 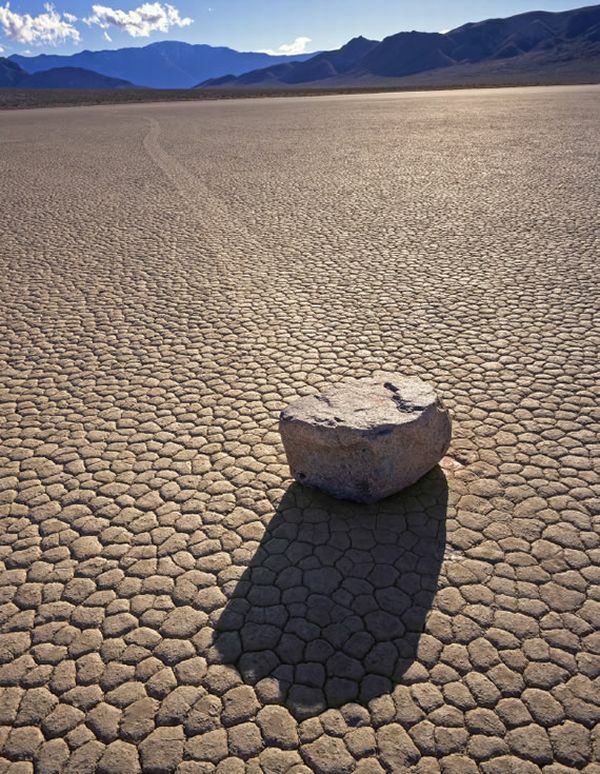 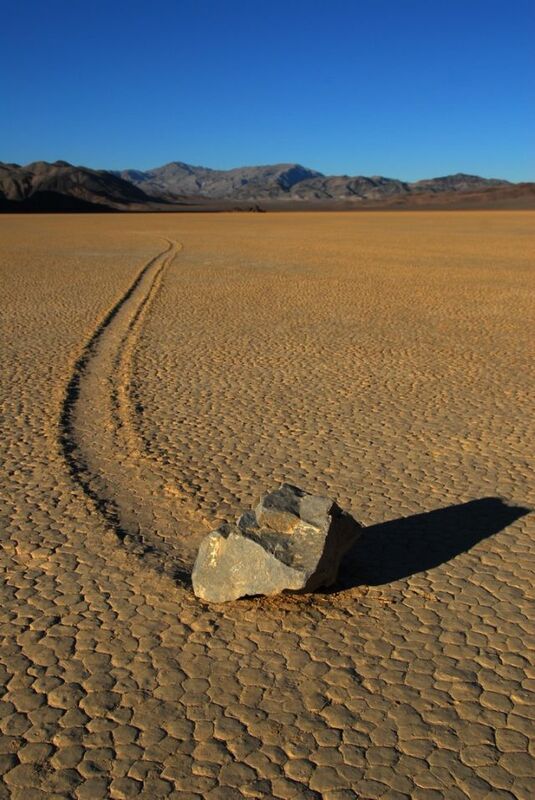 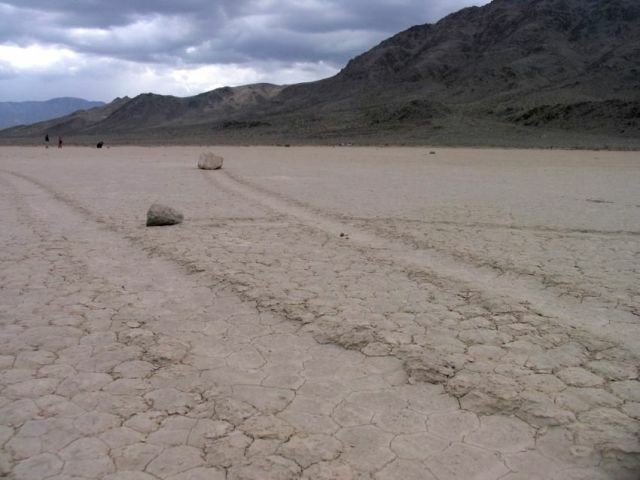 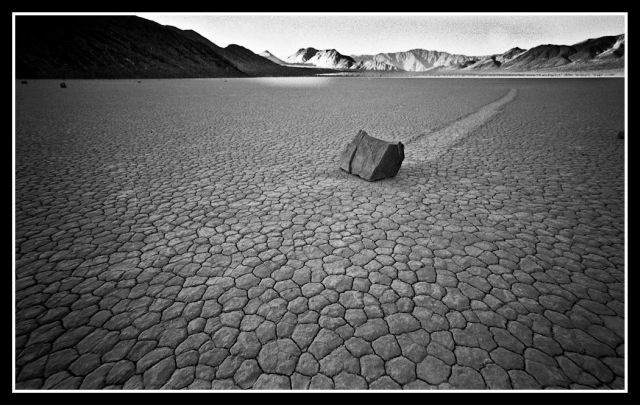 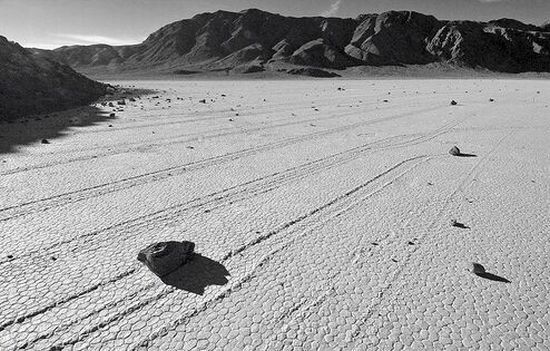 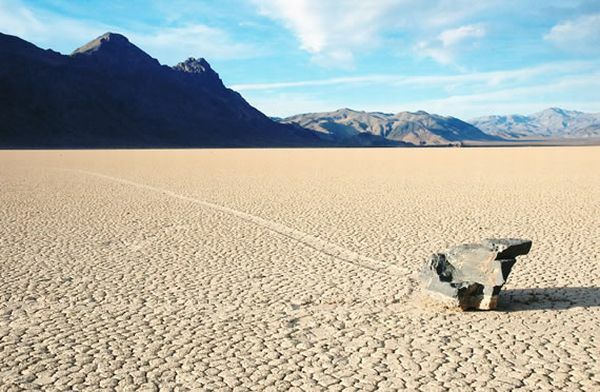 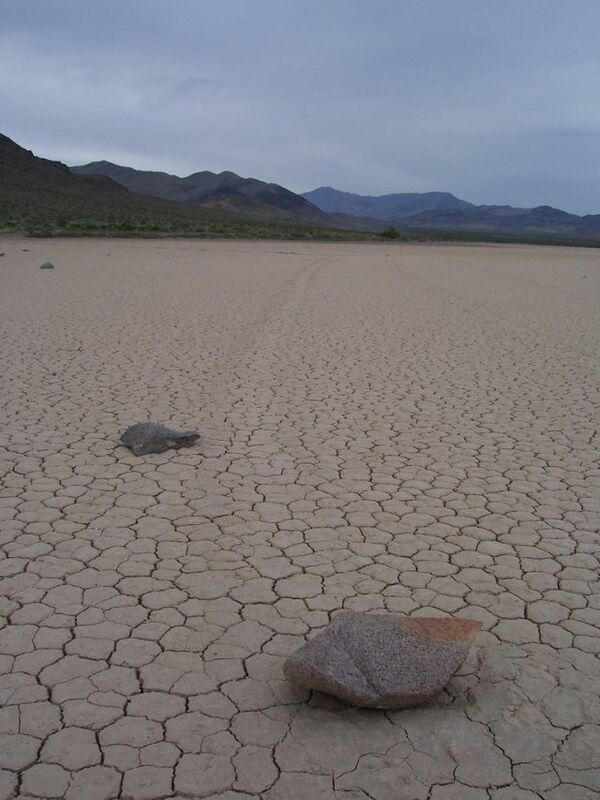 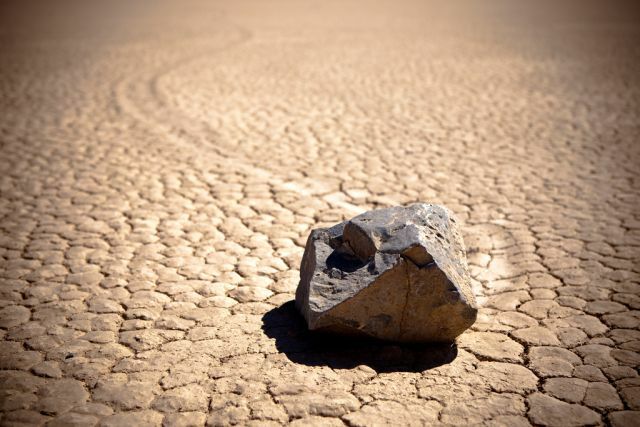 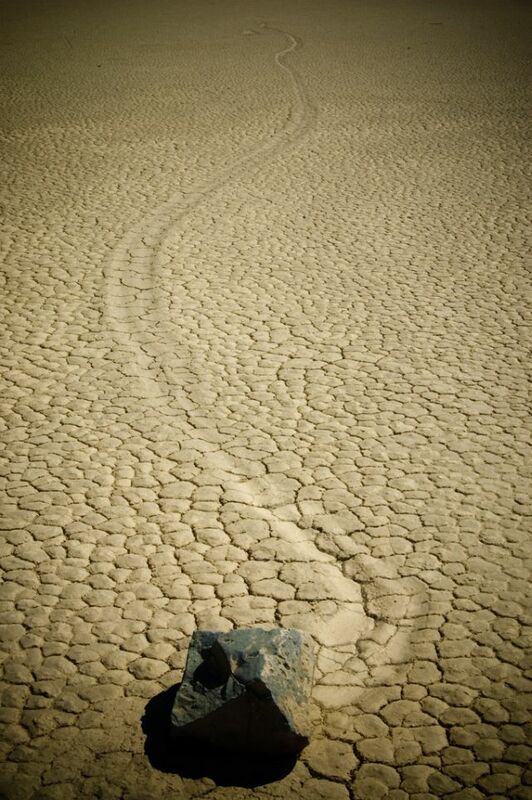 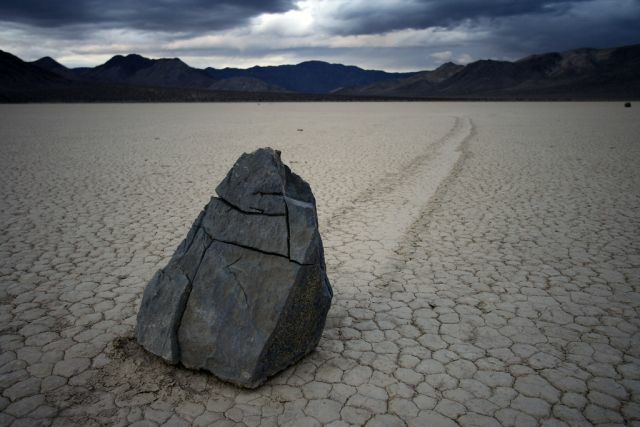 The sailing stones (sliding rocks, moving rocks) are a geological phenomenon where rocks move in long tracks along a smooth valley floor without human or animal intervention. 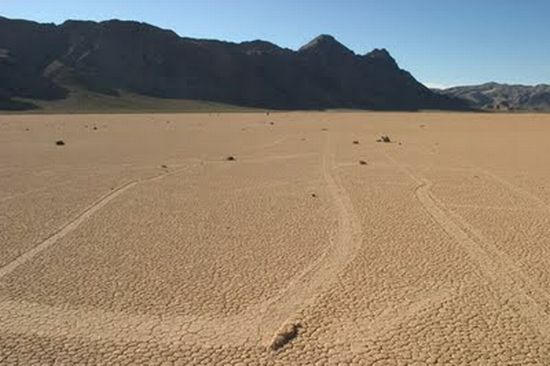 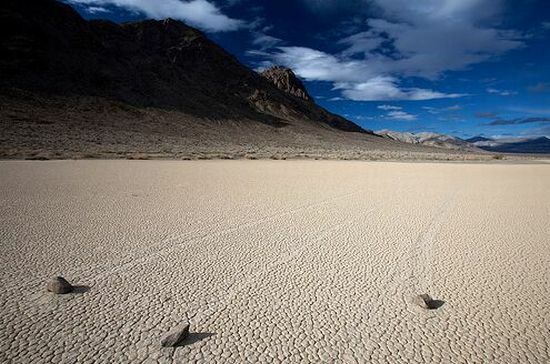 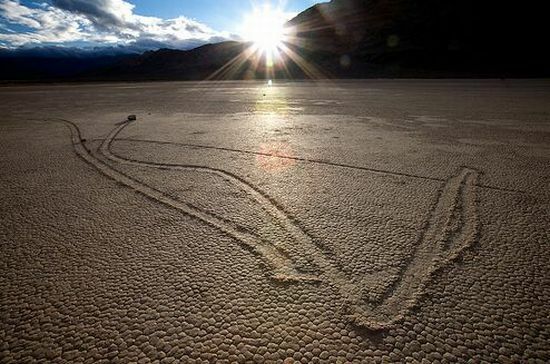 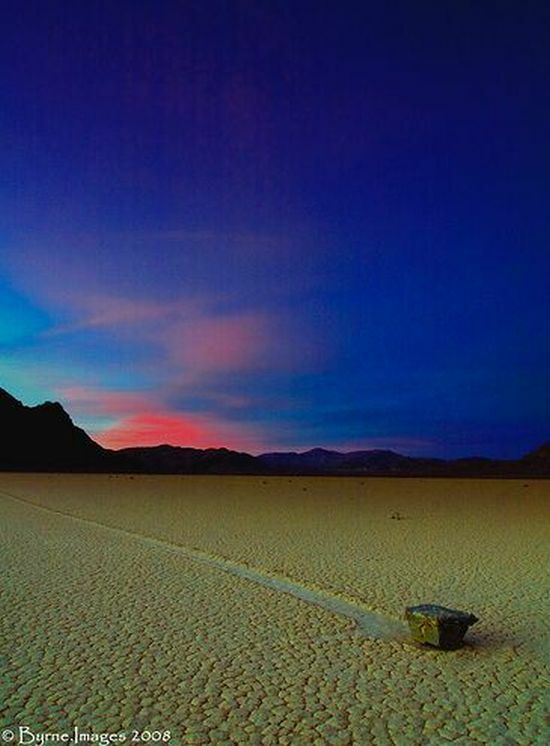 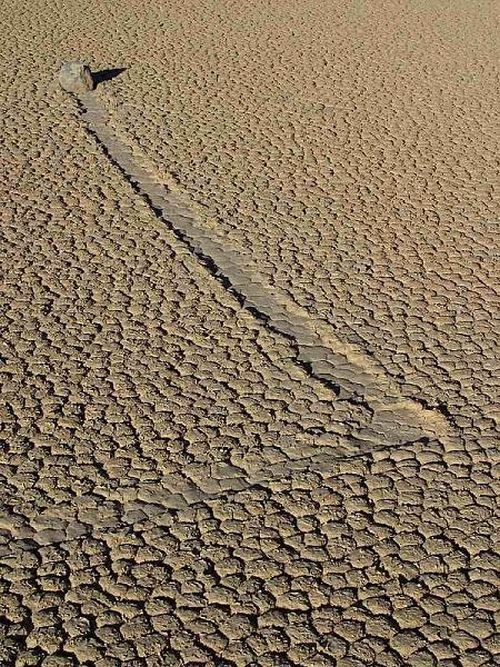 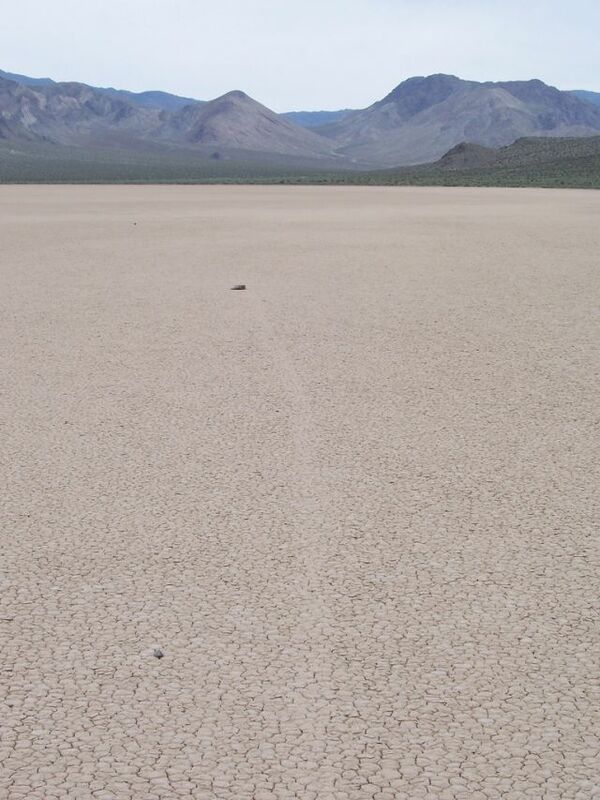 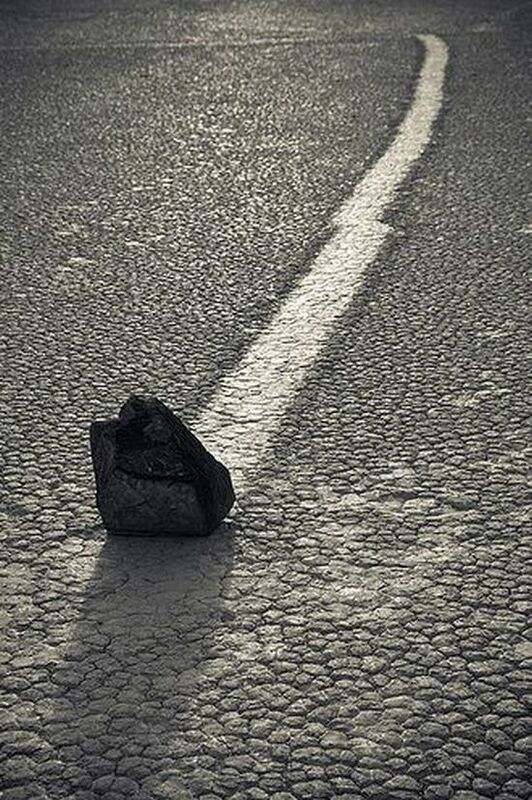 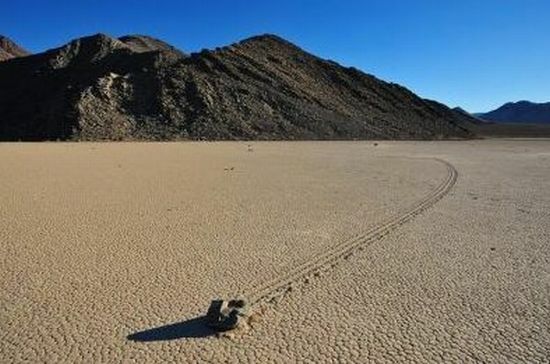 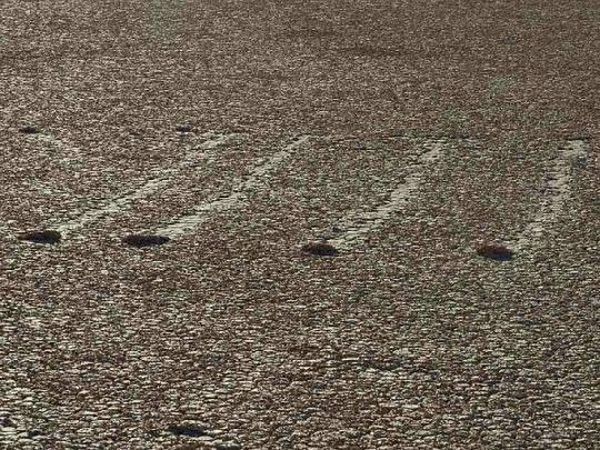 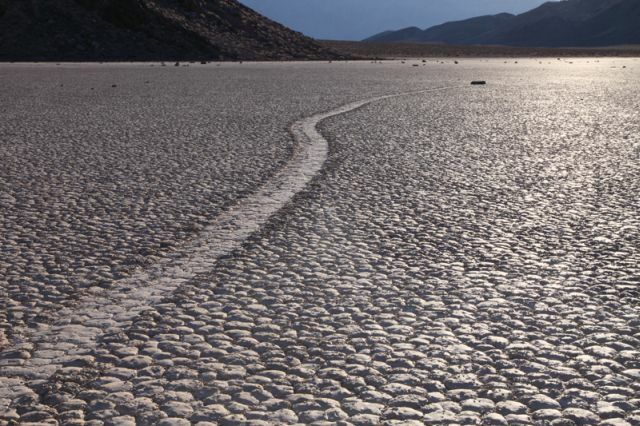 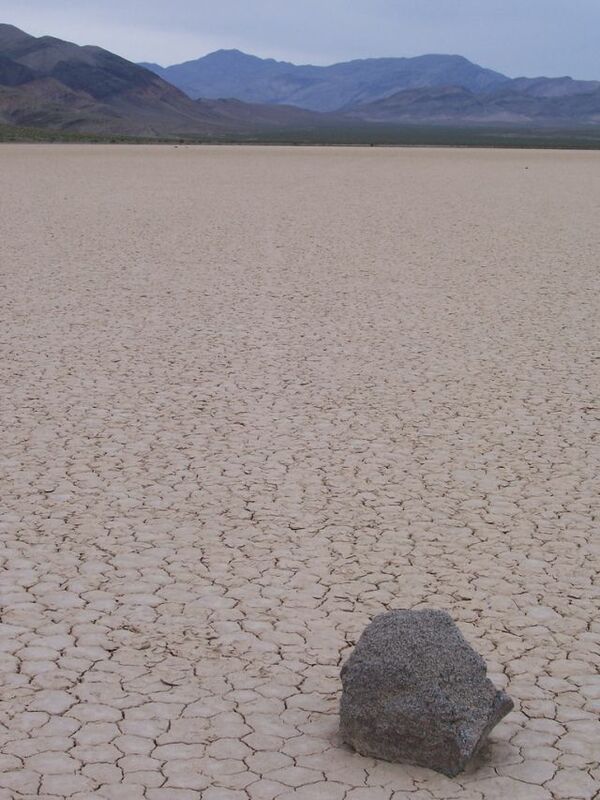 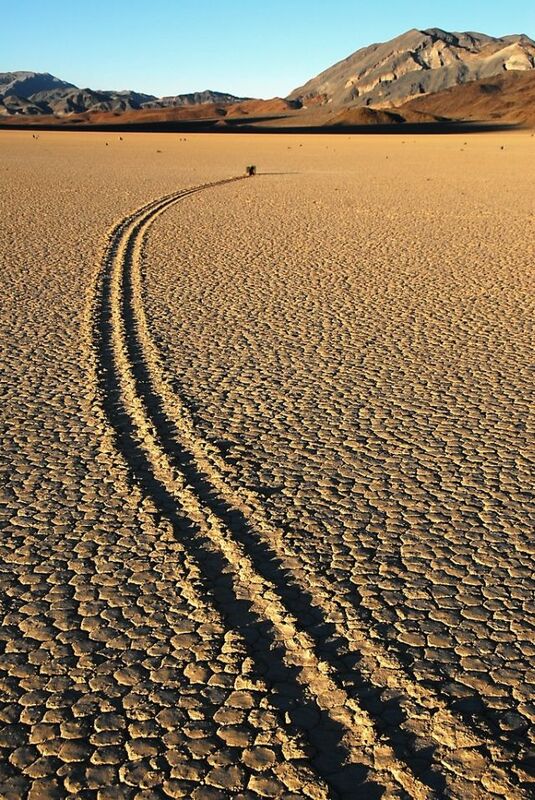 They have been recorded and studied in a number of places around Racetrack Playa, Death Valley, where the number and length of travel grooves are notable. 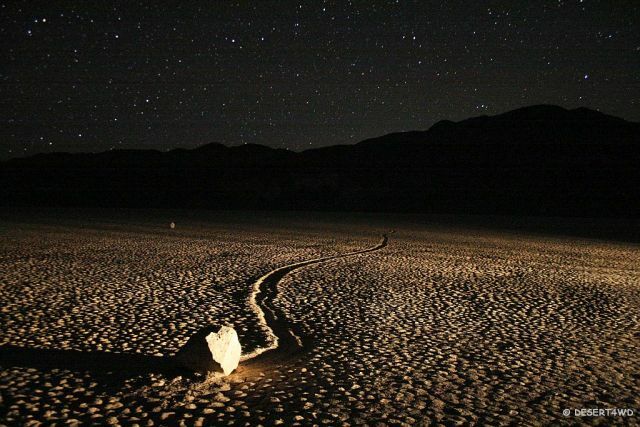 The force behind their movement is not understood and is subject to research. 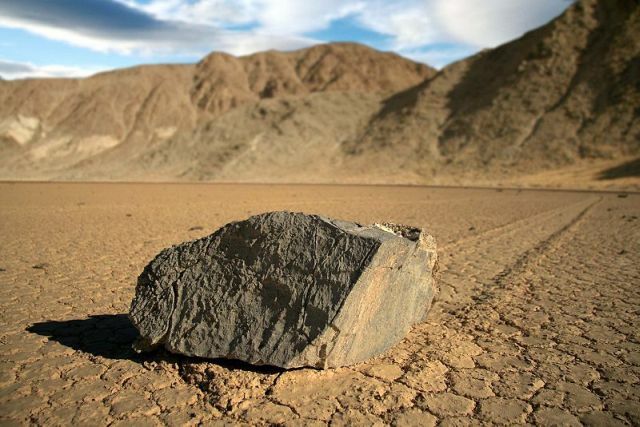 YAY NOOFOO!!! 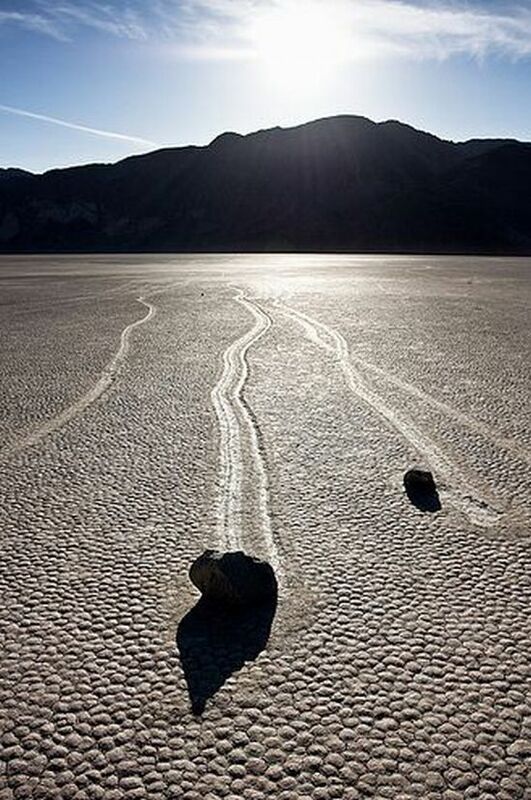 If I had to guess I would have said a combanation between wind and small tremours or earth quakes.. but earthquakes alone would not make the rocks move in such straight or deliberate lines. 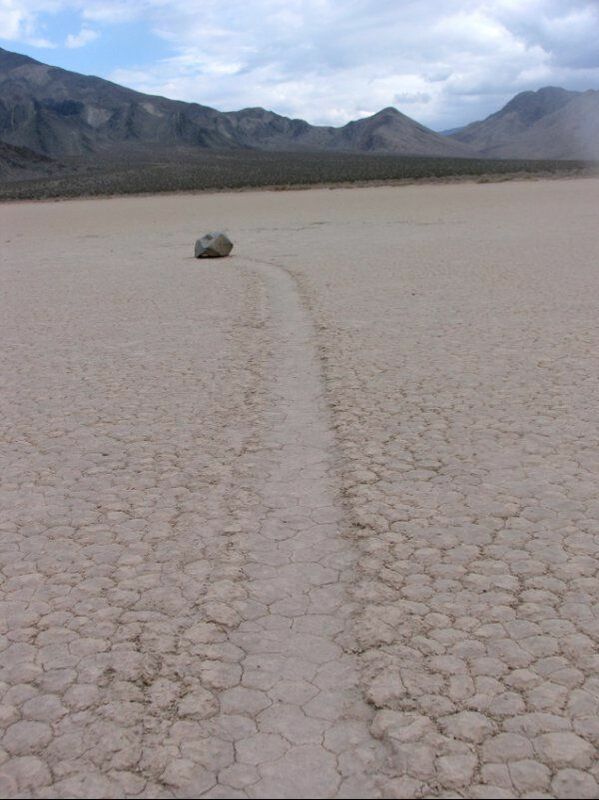 i would say wind too because if u look it seems the flattest part of the rock is toward the trail. 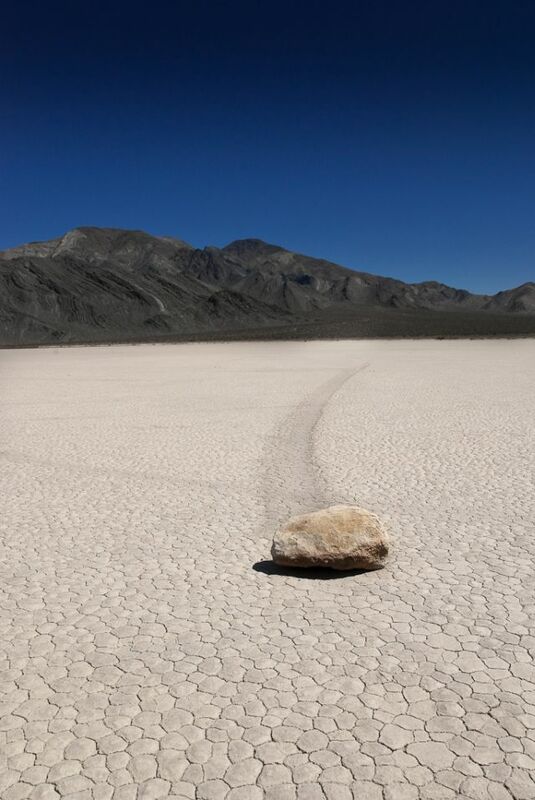 giving it an aerodynamic affect. 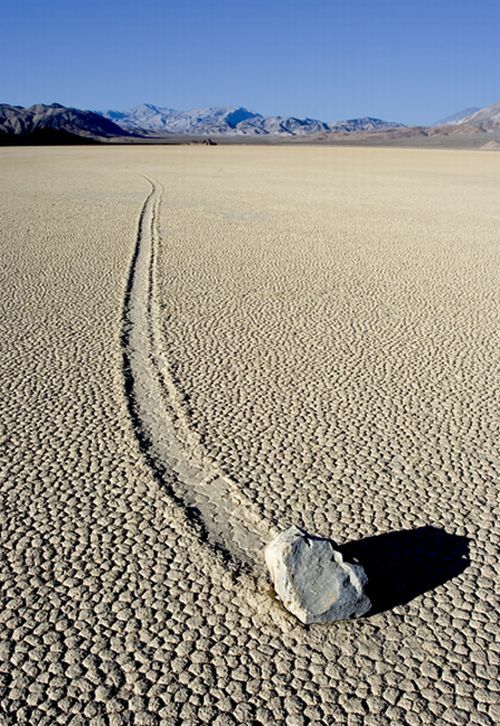 maybe just somebody (why not someone who took the photos) tied the stones with a long rope and pulled it along? 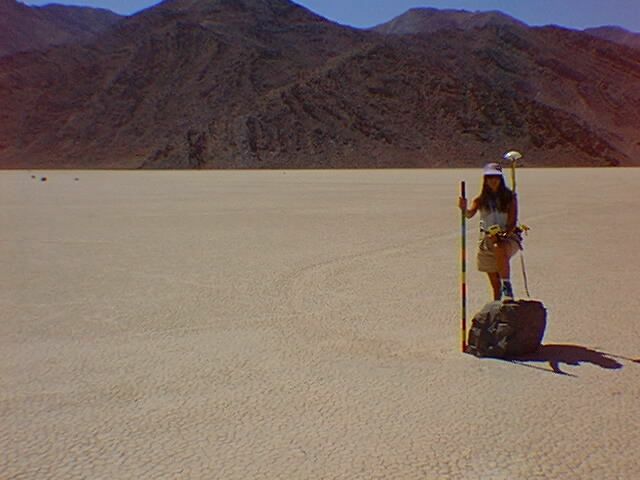 if you wonder no foot prints, then put a pole somewhere and use it as a fulcrum, pull it like L shape line. 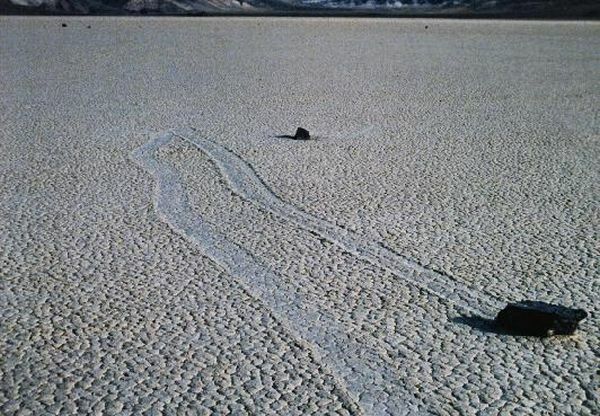 Seems to me most likely that the the area floods to a depth of an inch or so, then it starts to freeze, the stones get caught in largish ice sheets, and that wind pushed the ice sheets across a layer of lubricating water, dragging the stones. 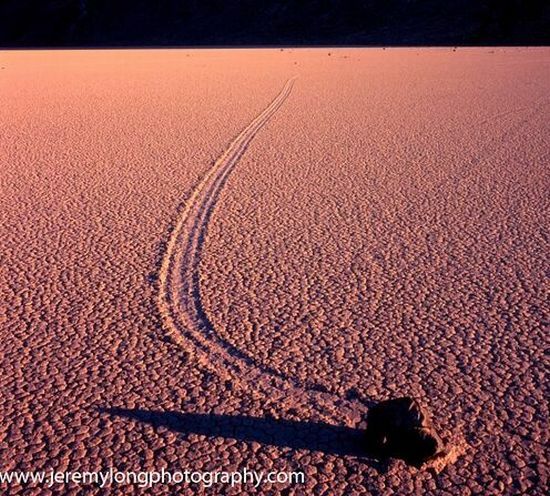 The force on the ice sheet is enough to overcome the friction of the stone sliding through a shallow layer of mud, which leaves the trail. 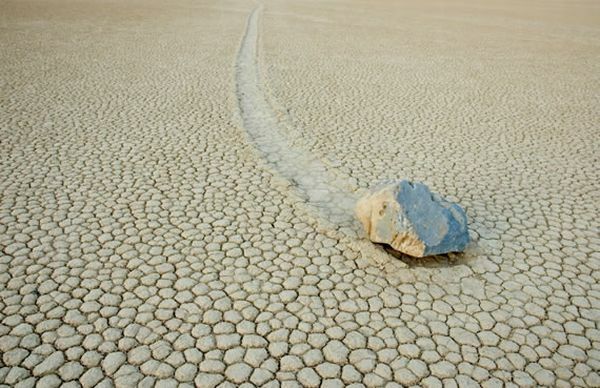 I don't see how this wouldn't explain all the observed phenomena. 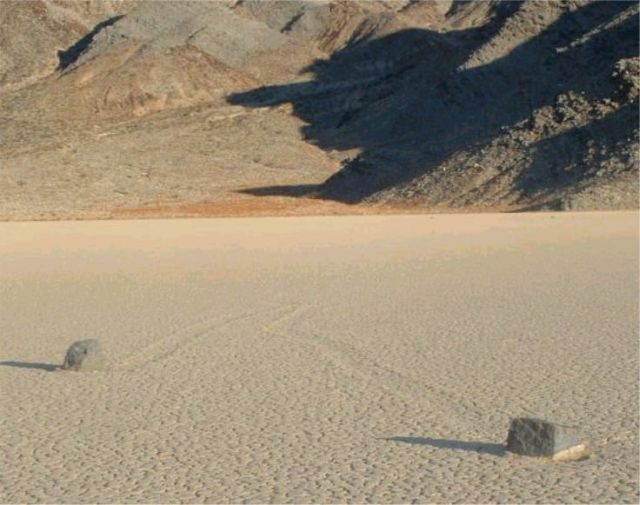 I agree that the wind wouldn't push the stones by itself. 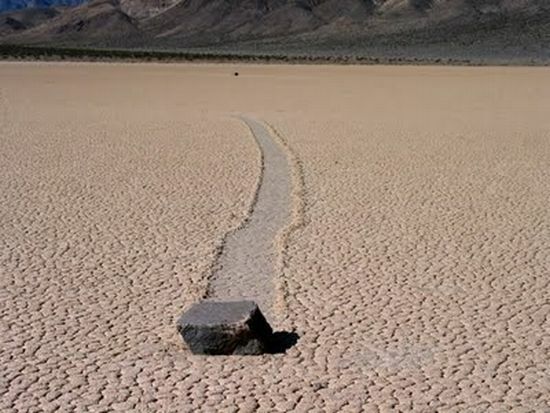 And lubricating just the stones wouldn't explain it either as it's apparent they meet with some friction in making those trails. 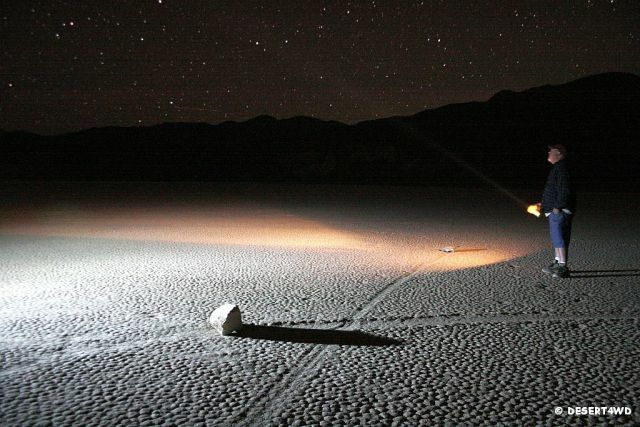 I certainly don't see any reason to resort to zero point quantum extra terrestrial orgone energies here.